Our design studio is situated in Ampthill, a historic market town in Bedfordshire, close to Woburn, Milton keynes and Hitchin, Hertfordshire. 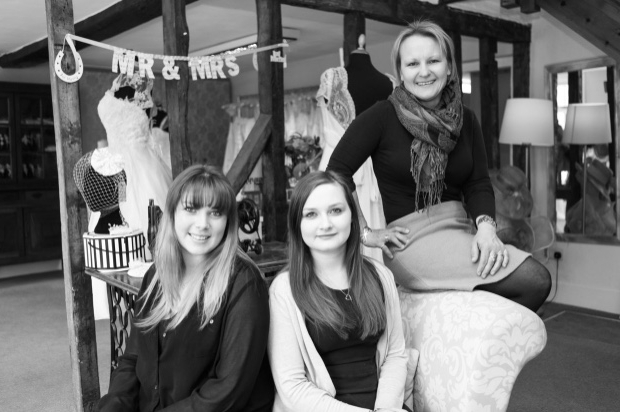 We are an experienced team but pride ourselves on our friendly approach as well as our undoubtable passion for creating bespoke wedding dresses and helping our brides visions become a reality on their big day. Melanie brings a wealth of experience, having started the business over 20 years ago after a career as a fashion designer working for some well-known high-end womenswear brands. With her fashion background Melanie has brought connections to London and internationally based cloth houses, giving our brides access to exclusive fabrics and trims. Mel’s passion is pattern cutting and she is never happier when at her work table creating exclusive patterns for our brides. Hollie has worked closely with Mel for many years and has completed various creative courses to gain a wealth of knowledge. She is a trained pattern cutter and highly experienced couture dress maker, meaning that when speaking with Hollie during your fittings, you know what is being designed will be made to a high standard. Hollie has always had a passion for textiles and fashion and loves talking with brides’ about ideas of their perfect wedding dress as much as she does creating them in the studio. Danielle has a background in art and design and studied at Fashion Capital in London. Danielle is an expert when it comes to hand beading and applique with a fantastic creative eye for perfectly finishing our wedding dresses. She is also an experienced garment technologist and production manager, she ensures our business runs smoothly, taking the time to answer all your queries.